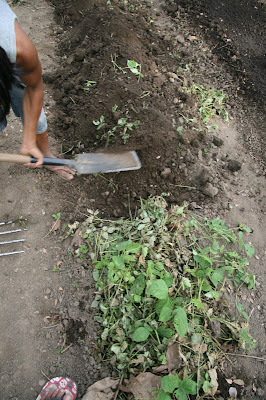 Double digging is easy, all you need is a spade or shovel, a spade fork, and some muscle. First, mark the area where your elevated plot will be situated. 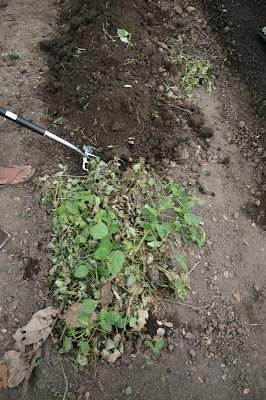 Loosen the soil with your spade fork by pushing it into the soil and moving the handle forward and backwards. Note: the picture above shows mung beans (green manure) being incorporated into the soil. Now, loosen the bottom 8 inches of your plot (again, look at the picture). Do not mix the topsoil with the subsoil. Just loosen the subsoil. Do this over and over and over until you reach the end of your plot. ..try zero-minimum tillage. It preserves natural soil stucture and protects the microbial ecology in the soil. Kawawa naman ang mga beneficial microorganisms if papatayin mo after mong paramihin..
if u r using the same area in a staggard planting scheme, u may consider using a subsoil irrigation system to inject nutrients (in liquid form-compost tea since u have it) directly into the rootzone..no more digging or tilling for life! a less expensive alternative is furrow irrigation. thanks for the advice yano_yan. acctually we practice minimal tillage.